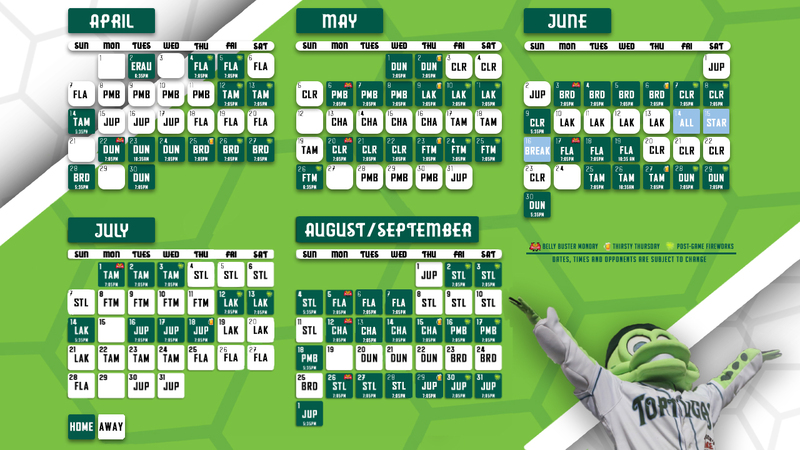 DAYTONA BEACH, FL - Coming off a North Division Championship and a Florida State League runner-up season, the Daytona Tortugas are excited to announce the official 2019 schedule. The schedule is highlighted by an unprecedented 73 home games at Jackie Robinson Ballpark, including double-digit home dates on Thirsty Thursdays, Firework Fridays and Saturday Firework Extravaganzas. 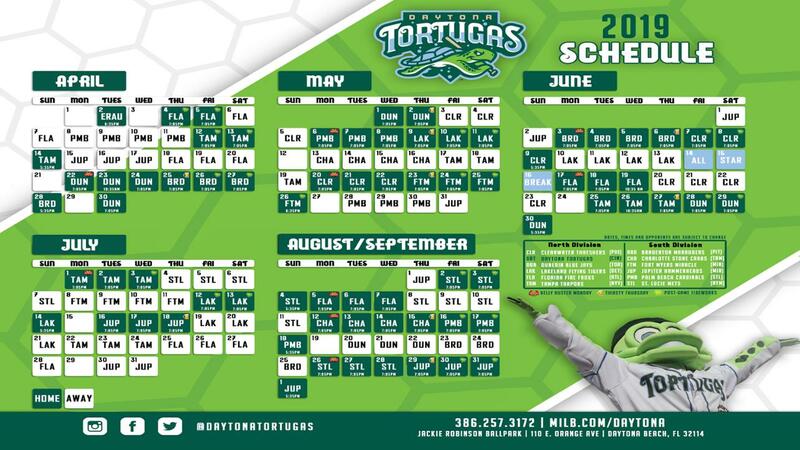 Mark your calendars for Thursday, April 4th for Opening Night against the Florida Fire Frogs as the Tortugas defend their throne as "Kings of the North". The 2019 season will mark the 100th anniversary for the Florida State League. Last season, Daytona Beach Baseball surpassed both the all-time attendance record and most total wins for the league. The 2019 campaign will mark the 75th season of Daytona Baseball in the Florida State League, which is the longest tenured team in the league. This historic season is sure to be special as the Tortugas introduce a brand new playing surface at Jackie Robinson Ballpark. The Tortugas are also coming off of back-to-back Florida State League promotional awards and 2019 will be no different. The promotional calendar is set to be released on Monday, January 14th and will include some unforgettable nights at Jackie Robinson Ballpark. The Tortugas are the proud affiliate of the Cincinnati Reds and will welcome some of the best prospects in the game, once again, in 2019. Opening Night on Thursday, April 4th is only 108 days away! Call (386) 257-3172 for information on season tickets, flex plans or if interested in hosting your group night at the ballpark.